Build solid legs with the Force USA Monster Ultimate Leg Press and Hack Squat Combo. The trainers choice. Used by high performance trainers, strength coaches, athletes and personal trainers. Staying ahead of the competition with Innovative features designed by demand. The Force USA research and development team consists of trainers and athletes who use the equipment. The Force USA MLPHS is a 2 in 1 combination Leg Press and Hack Squat strength machine. Build incredible lower body strength. Boost your metabolism. Increase your athleticism and develop a solid foundation for all of your strength training. The Force USA Monster Ultimate Leg Press and Hack Squat Combo provides lower body exercise movements to get explosive strength rapidly. Target your Quadriceps, Hips and Glutes with deeper Hack Squats and varied foot positions for Leg Press movements. The Leg Press and Hack Squat Combo feels ultra-smooth in motion thanks to the Force USA Hover-Glide mechanism. 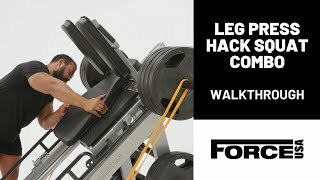 The Force USA MLPHS can switch from Leg Press to Hack Squat in seconds. Everything is fully adjustable. Back pad angle, foot plate angle and safety stopper adjust with a simple pull of the pop-pin. Built-in safety components provide enhanced safety. Train confidently to failure. Safety rail handles on both sides. Adjustable safety catch stops the carriage from lowering any further. Modern and considered design. Fully adjustable for all user heights. Quick setup for your intended usage. Safe entry and exit. Simple to use even if you’ve never used a Leg Press machine before. Achieve rapid gains by adding Force USA Super Bands (sold separately) to your leg press exercises. Band peg positions on the upper frame provide assistance and lower frame positions add greater resistance to your concentric phase. The Force USA Monster Ultimate Leg Press / Hack Squat has sleeves for Standard weight plates and adaptor sleeves to take Olympic sized weight plates. Extended length upper carriage sleeves combined with rear carriage carriers. Heavy duty and big enough to carry a massive amount of weight plates. Keep your gym space tidy. The Force USA Leg Press / Hack Squat has 6 sleeves for weight plate storage compatible with Standard or Olympic weight plates. The guide rails for the Hover-Glide mechanism are longer to enable your full range of motion throughout the exercise movement. High density commercial grade foam padding with ultra thick laminated wood base. Firm and comfortable.